Social Enterprise Manitoba as the project manager of the MSES played a critical “backbone” function much in the way that an industry association supports the work and members of any sector through information dissemination, professional development, bridge-building, advocacy and sector innovation. The MSES was seen as vital to “ecosystem development” in that significant preparatory work was needed in the sector to allow the true potential of the sector and its member organizations to emerge and be realized. This involved bringing diverse stakeholders together, developing a shared understanding and language, identifying barriers to implementation, defining new market opportunities and beginning to work on possible solutions to problems all while expanding capacity in both the supply-side and the demand-side of the sector. Based on feedback from stakeholders and the frequency of certain responses, this development work seemed to be following the typical AIDA path of creating awareness, interest, desire and then action. There was a strong sense that the MSES had accelerated awareness, interest and desire for further business development opportunities in the social enterprise sector, but that so much more was possible. Based on a review of impact, activities, and a final community consultation, these recommendations begin to form the basis for a new phase of sector development. 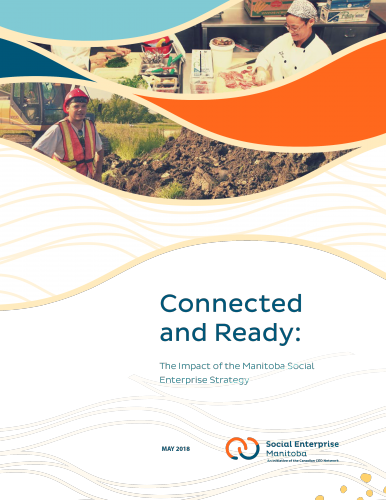 The Province of Manitoba should tap into the potential and momentum built by the MSES by investing $200,000 per year for at least 5 years in a second phase of the MSES. The proposed investment should be a partnership with Social Enterprise Manitoba, acting as a sector “backbone” to support work integration social enterprise through information dissemination, professional development opportunities, bridge-building, advocacy and sector innovation. a. Organizational Development in business development, evaluation, accessing capital and financial management, scaling and replication of proven models/activities and marketing. Social Enterprise Manitoba should continue to incubate a social procurement intermediary while also supporting the developing Buy Social Prairies1 model. The Province of Manitoba should develop and implement a social procurement strategy using co-creation principles. a. How the social enterprise model can best support problem solving in rural and northern Manitoba. b. How to ensure social enterprise opportunities better serve women. c. How to strengthen connections with Manitoba’s Indigenous communities. d. What are the gaps in wrap-around supports, and what are the limitations of the WISE model? e. How to offer a wider range of career options and open up untapped markets by developing new social enterprises in new industries. f. How to capture the monetary and non-monetary outcomes and results of social enterpise. 1 Buy Social Prairies (affiliate of Buy Social Canada) is a newly established initiative to certify social enterprises and promote social purchasing by individuals, governments and companies.